I do an attempt at rocking boat yoga, and complete my breathing exercises to start the day off well and train for the funderwater zone. Then I’m off for salty shower numero uno. I grab my mask and fins and check on my ancestors in the sea. Not many are at home. I see so much dead coral. I’m getting more and more worried about this. I capture some footage and swim back to the little 36ft sailing boat. I climb back on board and rinse myself with three drops of freshwater. Washing my hair is not part of the routine anymore. I chop a papaya for breakfast. Make a suzy style tea with ginger, lemongrass and mint tea from my nomad survival kit. Fellow crew wakes up and while having breakfast we make an exploration plan for the day. My breakfast is a party. I have a big bowl of muesli with nuts, seeds, cinnamon, and a peanut butter sandwich. A new addiction since I’m eating vegan. I’m fuelled to rock the day! Fellow nomad crew Erin gets out her paint and paper. Felix works on his design ideas. The captain is designing a tiny 20 square meter minimalistic home to have a base on land. I’m working on a book about hitchhiking on sailing boats and saving the ocean. I’ve been working on and off on the hitch sailing guide since I returned from a sailing trip of the great Atlantic Ocean cycle. I boathitchhiked from Europe to the Caribbean and then caught a ride back from the Caribbean via the Azores to Europe. The ocean crossings have been an amazing and eye opening adventure so now I’m writing a guide to help others get into sailing an ocean. Not only on how it all works to boathitchhike across the Atlantic, and how to prepare for ocean travel, but also how one can contribute to a healthy ocean. Nature needs us more than ever. There’s so many simple actions we can take as an individual. Between the provisions, pillows and duffel bags, I find my tools and start writing the chapter on ‘what to tell mum’. I think she’s finally OK with my foreign lifestyle of endless surprising adventures. She thinks my next adventure is going to be dancing with penguins in Antartica. I’m not excluding the idea. I’ve been writing much more at at Andaman sea, than I did the last few weeks on land. Here I feel energized and optimized for creativity, and my brain is fully oxygenated. Plus, there are no distractions. Only nature. And trash. There’s a straw floating by, a foamy lunchbox and in the distance I see some bottles. Nature is calling. I ditch the pen and paper and move my office to the ocean so I can grab this stuff before a sea-turtle thinks it’s something to stick in his nose. Like I do every day, I #Take3forthesea. An easy action collecting three pieces of garbage for the planet, every time you go out and play. 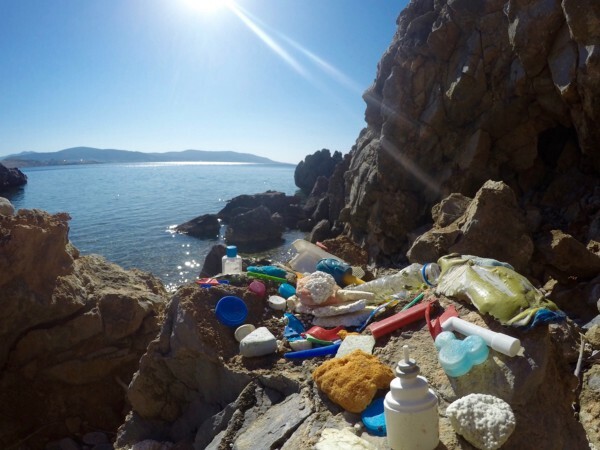 Plastic pollution that washes up on shore. Beach trash collected in 5 minutes! Beach clean up. 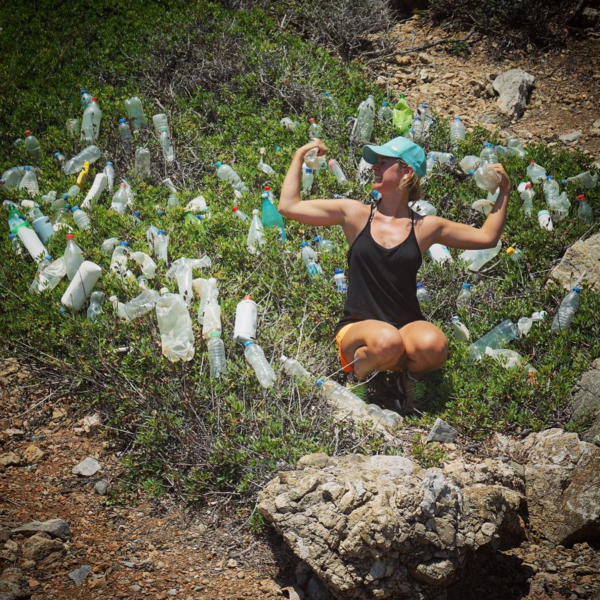 Water Bottles collected in a radius of 20 meter. Time to pull up the anchor. We have a breeze! We’ll pull up the main and roll out the jib. I love this feeling! With a superspeed of 4 knots (that’s jogging speed), we’re on sailing to the next bay in Langkawi. The captain chills with his book and I take the wheel. I navigate through mini islands, fishing boats and nets. In pure Suzy zigzag style we move forward. I find it awesome how much trust he puts in me. 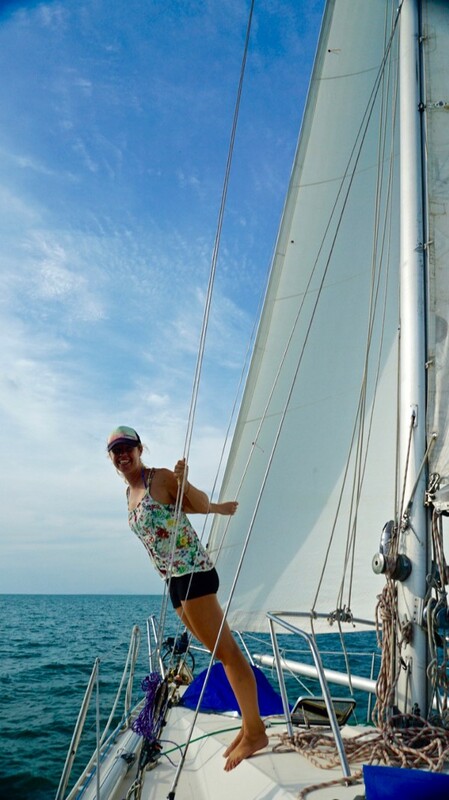 I don’t have any sailing license whatsoever, but I have hitch-sailed on 8 boats and logged +10.000 nautical miles by now so I did learn a fair bit about sailing, seamanship and the ocean. While admiring the rough Malaysian landscapes, myself and the other ocean nomads get into discussions about society, business ideas, the future and questions of life. The connections I make with people at sea go deeper in one day than those I make in weeks on land. At sea no one is ‘on the run’ or constantly checking in on things. We just be. I take my microplastic water sample. Later it’s sent to the ‘Adventurers and Scientists for Conservation’ lab to measure micro plastic parcels. Though you cannot see it, it’s full of it. Every sample I’ve taken so far had plastic. I used to love eating fish now I can only love them alive. We need those fish left to rejuvenate. Also I don’t believe it’s healthy to eat them anymore, so I choose omegas from a different source. Seeds: another must-have item in my nomad gear. Nothing is more important than your health. If you’re fit, you can proactively tackle challenges and make the most out of every minute. So I prioritize to stay healthy. Life is already short enough. Sailing means going offline. 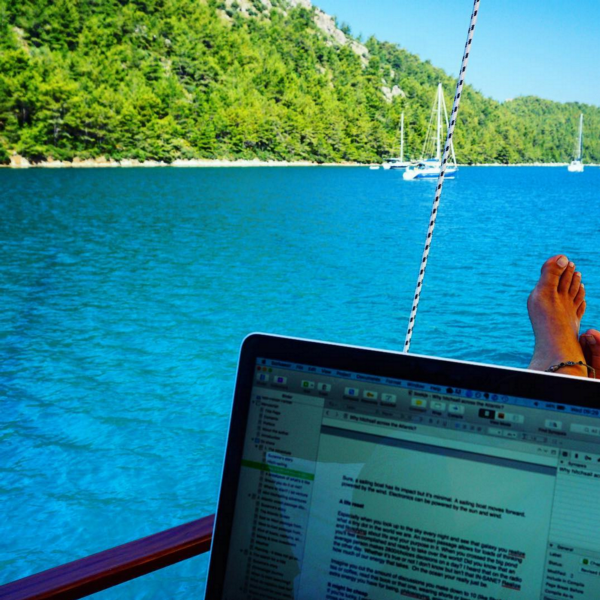 But going offline for days is not easy for a digital nomad. What if someone needs me? What if my website goes down? What if this, what if that? As learned from Tim Ferris, I ask myself: what’s the worse that can happen? By going offline for a while I might miss out on a few pesos for the adventure fund or miss the news which is depressing anyway. Further than that I can only see benefits for the sake of adventure, experience, nature and personal growth. Almost everywhere we go, we are connected ALL THE TIME. With the internet just one click away, and an overload of interesting things to check, I HAVE to remove the possibility of connection. 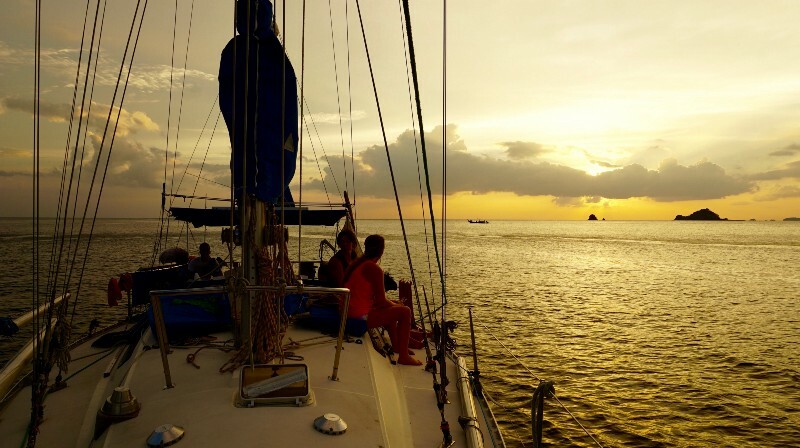 A sailing adventure does that for me, because it’s days or weeks of disconnection. Being disconnected from everything but nature allows to me fully focus and express myself in one task. There is no stress. No media. No deadlines. No pressure. No people wanting something from you, except for the captain expecting you to take part in duties on board like taking the wheel, hoist the sail, or pouring a glass of wine. That’s fun stuff. Offline means I’m having the most beautiful and deep conversations without anyone being half present because the phone is asking for attention. For me, offline means coming back to realizing what you really love doing most, because you’re doing that and only that. For me that’s being in or near the ocean, the water, encountering marine life and exploring it! Whether that’s through freediving, sailing, or a hike to the top of the hill to discover which other secluded bay we should explore. These explorations have taught me how much the ocean needs us NOW since we have been taking so much from it. It has made me more determined than ever to do something about it. Being offline and fully immersed in nature makes me think about why we are here on the planet. Money, fun and stuff are all temporary. Our impact will last so we better make it a good one! 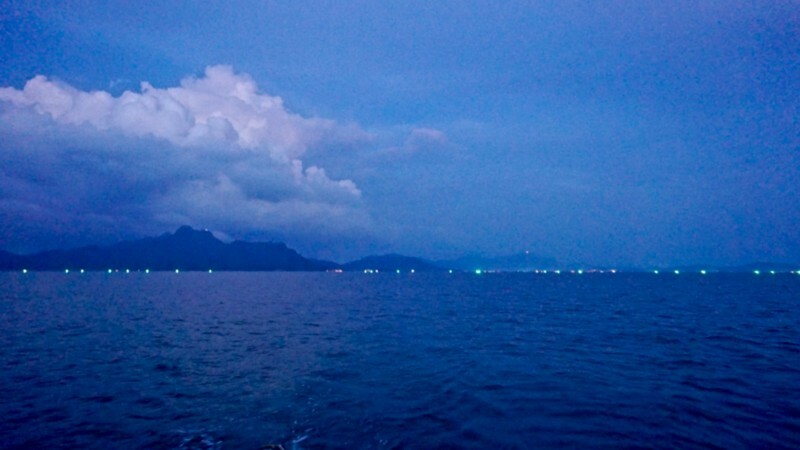 Each light is a fishing boat. Every night, every signal day. No rocket science that this is not sustainable. Bleep Bleep! We have a signal. And there goes the peace of mind… After days of disconnection from the wifi zone the amount I receive is horrendous. Is there anything urgent? Not really. Important? Always. I am building a community around ocean lovers, adventure-seekers and change-makers so consistency, engagement and connection is important to maintain. But so is playtime in nature, so back to offline! After a few hours of sailing we have arrived in a beautiful new bay and it’s time to play! This is a must in every one of my days. My brain is making over hours thinking about tackling ocean issues and developing ideas on how to implement solutions and encouraging the world to act. I need to revive and connect 100% to nature to be able to keep going. My biggest passion at the moment is freediving. It’s the purest way of connecting with the ocean and life below the surface. It enables me to reach a state of pure flow. It’s my meditation. It’s amazing how much I’ve learned about myself and the ocean through freediving. And about the importance of breathing properly and consciously. We can go weeks without food, days without water, but only minutes without breathing. After some splashing around we take the dingy and row to the island in front of us. As always, I’m extremely curious what we’re going to discover this time! A boat is a very small and intimate space. Deep connections are created easily, but so are irritations. There’s a few unwritten rules and you should not talk about politics, religion, or money. We discuss all of them during dinner and as the sun sets we salute to another day in paradise. (No one has been thrown overboard ;)). After dinner we lay down on the deck and look at the sky. With not a single light near us the night sky is the show to watch. I’m so grateful for this. We philosophize about life and our own roles in our short lives on this tiny part of the galaxy. What legacy are we going to build? Before I close my eyes I’m thinking about the day ahead. What am I going to do to have fun? What am I going to do contribute? What am I going to do to stay healthy? And what am I going to do to reach closer to the goal of saving the ocean? I fall asleep on the deck. I think I’ll make tomorrow today again. Cheers to another day in paradise! Does a hitch-sailing day like this sounds like fun? Check out Ocean Nomad, the adventure travel guide to the ocean, for the ocean. What's it like to boat-hitchhike? 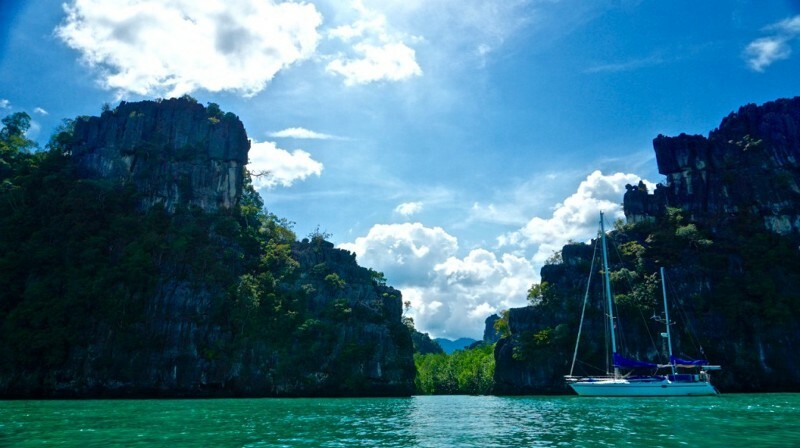 Here's a typical day on an island hopping hitch-sailing adventure I did from Langkawi Malaysia to Phuket Thailand in South East Asia.